(Dar es Salaam) Former Prime Minister and Secretary General of the then Organization for African Unity (OAU) – now African Union (AU), Dr. Salim Ahmed Salim joined multitudes in paying last respects to Ifakara Health Institute’s seasoned researcher and former Deputy Director Dr. Godfrey Mbaruku. 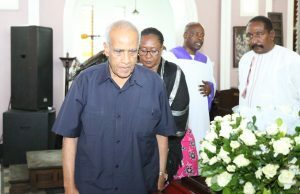 Dr. Salim paid his last respects at St. Alban cathedral in Dar es Salaam where Dr. Mbaruku’s body was laid for 2 hours (from 1pm to 3pm) for the ritual and the requiem mass. Families, close friends, neighbors and IHI staff had paid their last respects at Dr. Mbaruku’s Mbezi Beach home earlier on (from 11-12noon). Dr. Mbaruku died at his Mbezi Beach home on Sunday morning (September 2, 2018). IHI chief human resources and operations officer Martha Baare revealed the sad news in her brief email to Institute’s staff on Sunday September 2, 2018. “My hands are trembling as I’m writing this email to you now. We have received very shocking news that Dr. Mbaruku has left us. More details will be availed later,” reads Baare’s email in part. Information obtained later, indicated that the researcher died at his Mbezi Beach home and was to be buried at the Kinondoni Cemetery in Dar es Salaam on a Wednesday of September 5, 2018.